The F.·.W.·. Blog: Freemason Ron Paul A Serious Contender in 2012? 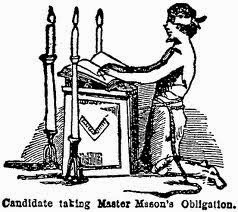 The Duegard of the Master Mason alludes to the position of the hands when taking the oath of the Master Mason, "both hands resting on the Holy Bible, square, and compasses."